A multi-agency examination of imported shipping containers at the Philadelphia seaport netted 1,185 pounds of cocaine Tuesday, March 19. 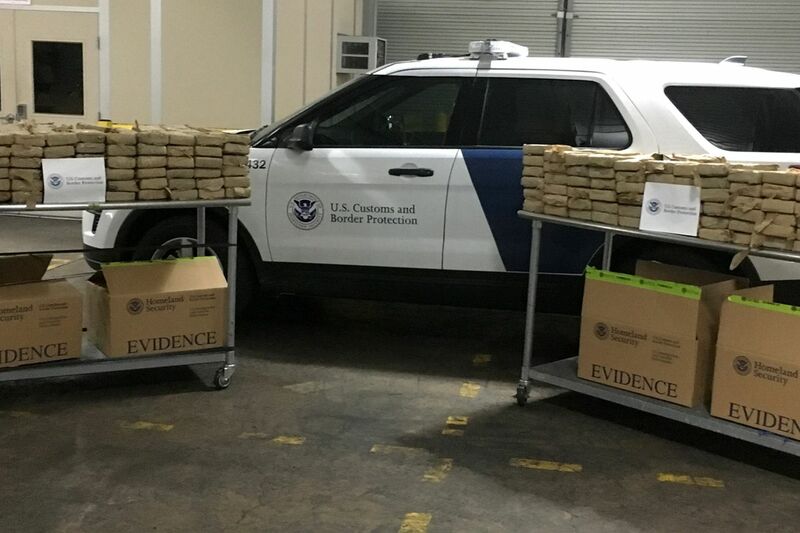 U.S. Customs and Border Protection agents said Thursday that they had seized 1,185 pounds of cocaine from a shipping container at the Port of Philadelphia this week, a haul that authorities estimated was worth $38 million and called the largest cocaine bust at the port in 21 years. Joseph Martella, the customs agency’s area port director for Philadelphia, said at a news conference that the drugs, discovered Tuesday, were packed as 450 bricks inside 13 large black duffel bags that had been tossed on top of cargo on a ship bound for the Netherlands. Martella said it was not clear when the drugs had been loaded into the shipping container, and authorities did not announce any arrests. In a statement, Customs and Border Protection agents said the shipping container was carrying natural rubber that had been loaded in Guatemala. Federal authorities said the cocaine was found in duffel bags that had been tossed on top of cargo on a ship bound for the Netherlands. The bust came less than two weeks after federal authorities at the Port of New York/Newark announced they had discovered 3,200 pounds of cocaine — with an estimated street value of $77 million — inside a shipping container, the largest cocaine seizure there in nearly 25 years. In Philadelphia, customs agents earlier this month said they had seized nearly 614 pounds of marijuana inside a shipping container, which they estimated had a street value of $2.5 million. In fiscal year 2018, Customs and Border Protection agents seized an average of 4,657 pounds of narcotics per day, the agency reported on its website. A report issued last year by the Drug Enforcement Administration said that cocaine’s “availability and use in the United States continued to rise between 2016 and 2017,” and that Customs agents seized more kilograms of cocaine in 2017 than any year since at least 2010.